Its been almost two weeks since my last post... I really really have to be harder on myself about getting these up more frequently, so please feel free to give me a push! BUT I have been oh so busy. I turned 26 last week, and in my life, every year is a big party year... ha! I just REALLY love parties, and so I've been busy celebrating. A couple of days before the workshop started, the prep began! 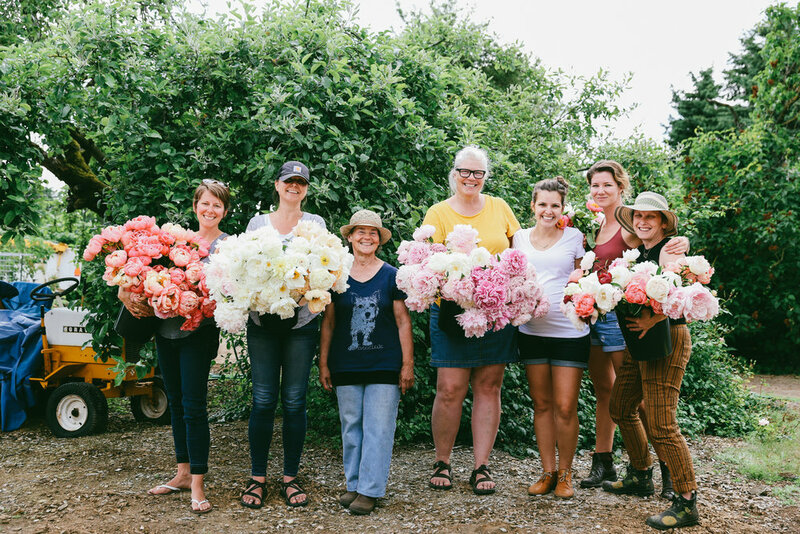 And so after a morning filled with harvesting at Erin & Chris' farm (which is the floral famous 'Floret') with the team, we headed off for a drive up the highway to Geraldine's peony PARADISE! I'm not entirely sure how Erin and Geraldine met, but I were sure glad they had! Geraldine supplies the peonies for the 'Floret Peony Workshop' in June every year. She's the sweetest little lady & has been farming peonies for over 20 years!! Through this connection, we were lucky enough to have this amazing and intimate experience that's not all that easy to come by! I also threw a photo in here on the mountains you could see from the farm... snow capped! SO beautiful!